Most popular wrap on the market today! Both sides are super soft absorbent fleece fabric with a center of dense sponge-like foam. Vac's exclusive stitching keeps foam from bunching up. 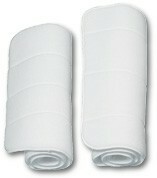 This soft pliable leg wrap contours to leg for custom-like fit and will not slip. Packaged in pairs. Made in the USA. Available in white only.